Illini Solar Car has had an exceptionally exciting week. 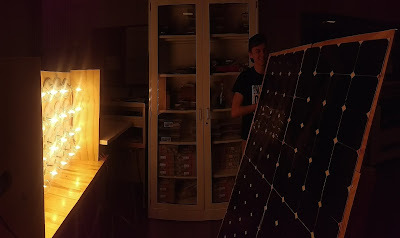 Bringing our motor to life using a small solar array and controlled by a prototype pedal was a firm confirmation of the team’s growing strength. This system was demonstrated January 30th for the Mayor of Chicago, Rahm Emanuel, during Pulse, an annual student-run technology conference held at Illinois. Along with Illini Solar Car, a prosthetics startup called Psyonic also gave the Mayor a demonstration of their work at one of the University's electronics work spaces. With a working pedal and basic dashboard structure, the driver can begin to interact with the car as they might on the road. This functionality allows the team to look at how different systems are working from not just a technical perspective, but also from an ergonomic and practical drivers perspective. Solutions that seem correct in planning and initial development phases may not turn out to be the best options during real-world testing. Illini Solar Car is aware of this, and evolving electrical systems accordingly. A few members of the team are venturing to Overland Park, Kansas over the past weekend to attend the Solar Car Conference held by the organizers of the American Solar Challenge and Formula Sun Grand Prix. This even marked the first time that Illini Solar Car has participated in an organized Solar Car event. During the conference the team members were able to learn a lot about everything from composite fabrication to team management. Additionally, they got to know many members of several other teams including our friends right up I-74 at Illinois State University. While our spirit for competition hasn’t slackened, loosening up to compare methodologies with established and experienced teams was only advantageous. With the goal of showing off a functional iteration of each system together in a rolling package for Engineering Open House (EOH) in March, Illini Solar Car is cohesively gaining momentum. The logistical challenges of the team’s end goal, competing in World Solar Challenge, are now receiving more attention by a greater number of team members. Involvement of the team's advisors, Professors Philpott, Pilawa, and Flachsbart, is also increasing. Although allowing the team to operate with independence for day to day operations, their guidance is necessary to hit certain goals with the University. If you will be around Champaign-Urbana during Engineering Open House on Friday March 10th and Saturday March 11th be sure to stop by and see the team and what is completed of our car! We'd love to see you there! Keep up on social media and here on our blog for further information about where we will be located during EOH. Excitement is only building, as the team sees many parts and components becoming integrated. Its a very special experience to see a project such as this come together piece by piece.